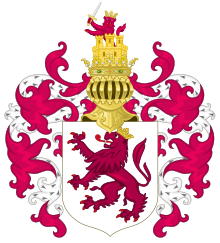 The Kingdom of León (UK: /leɪˈɒn/, US: /-ˈoʊn/; Spanish: [leˈon]; Astur-Leonese: Reinu de Llïón; Spanish: Reino de León; Galician: Reino de León; Portuguese: Reino de Leão; Latin: Regnum Legionense) was an independent kingdom situated in the northwest region of the Iberian Peninsula. It was founded in AD 910 when the Christian princes of Asturias along the northern coast of the peninsula shifted their capital from Oviedo to the city of León. The County of Castile separated in 931, the County of Portugal separated to become the independent Kingdom of Portugal in 1139 and the eastern, inland part of León was joined to the Kingdom of Castile in 1230. The Kingdom of León (Green) in 1095. León was created as a separate kingdom when the Asturian king, Alfonso the Great, divided his realm among his three sons. León was inherited by García I (910–914) who moved the capital of the kingdom of Astures to León. His successor was Ordoño II of León (914–924). The Kingdom of León continued to be the most important of all those of the Iberian Peninsula. However, Sancho III of Navarre (1004–1035) took over Castile in the 1020s, and managed León in the last year of his life, leaving Galicia to temporary independence. In the division of lands which followed his death, his son Fernando succeeded to the county of Castile. Two years later, in 1037, he defeated the king of León who died in the battle and because Fernando was married to the king of León sister, he became king of León and Galicia. For nearly 30 years, until his death in 1065, he ruled over the kingdom of León and the county of Castile as Ferdinand I of León. Thus, though scarcely influenced by the culture of the successor territories of the former Caliphate, Ferdinand I followed the example of the counts of Barcelona and the kings of Aragon and became hugely wealthy from the parias of the Taifas. When he died in 1065, his territories and the parias were split among his three sons, of whom Alfonso emerged the victor in the classic fratricidal strife common to feudal successions. The last two kings of an independent Kingdom of León (1157–1230) were Ferdinand II and Alfonso IX. Fernando II led León's conquest of Mérida, a city dating from Roman times. Alfonso IX, besides conquering the whole of Extremadura (including the cities of Cáceres and Badajoz), was the most modern king of his time, founding the University of Salamanca in 1212 and summoning in 1188 the first parliament with representation of the citizenry ever seen in Europe, the Cortes of León. 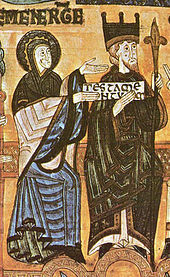 Alfonso IX did not want his kingdom to disappear upon his death and designated his heirs as Sancha and Dulce, the daughters of his first wife. In order to maintain the independence of the Kingdom of León, Afonso IX in his testament applied the Galician right of inheritance, that equaled in the succession men and women, leaving his daughters to be the future queens of León. However, when Alfonso IX died in 1230, his son by Berenguela of Castile, Ferdinand III of Castile, invaded León and assumed the crown. He thus became the first joint sovereign of both kingdoms since the death of Alfonso VII in 1157. 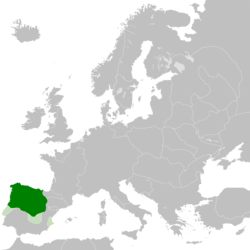 The isolated Atlantic province, the County of Portugal, had won independence in 1139 to become the Kingdom of Portugal. The union between León and Castile was never accepted by the Leonese people. King Ferdinand III needed 2 years to suppress the secessionist revolts in the Kingdom of León, so his son Alfonso X restored the independence of the Kingdom of León. However, this was not respected by his successor Sancho IV. His brother John waited until 1296, following Sancho's death the previous year, to be crowned as John I, King of León, Galicia and Sevilla. In 1301 he abdicated and the king of Castile assumed the Crown of León, reuniting the two kingdoms. ^ Keane, John (2010). The life and death of democracy (Paperback ed.). London: Pocket. ISBN 1416526064.